Spring has arrived early to Virginia and most of the east coast. I’m not complaining! Chirping cardinals and robins outside the window wake me up each morning. Opening the blinds reveal crisp, cobalt blue skies, sunny yellow daffodils, snow white tulips, and budding trees bursting with pretty pink cherry blossoms. The world is coming alive again! Bringing a bit of the beautiful blooms inside is always a must-do in our home. I treat myself to one fresh flower arrangement from the grocery store each week, but they fade and die so quickly. 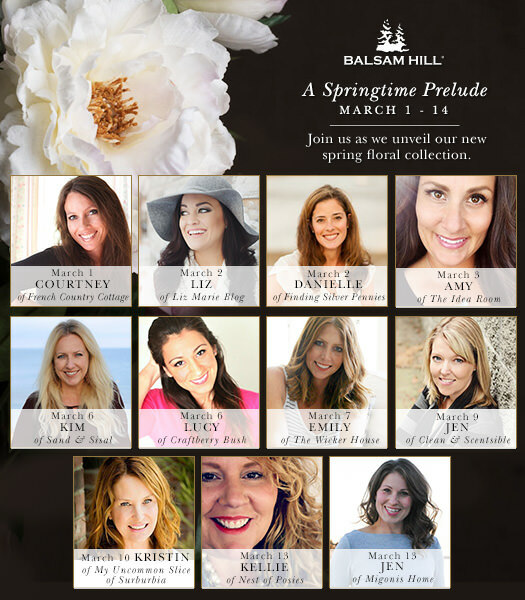 This year I’m celebrating the early arrival of spring by decorating with a mix of fresh and fabulous faux florals provided to me from Balsam Hill. These aren’t your grandma’s faux flowers. These faux florals are so realistic and lush, most people will never even realize they are faux! I’ve decorated my dining room for spring with luscious lavender. The versitility of decorating with garlands is endless. 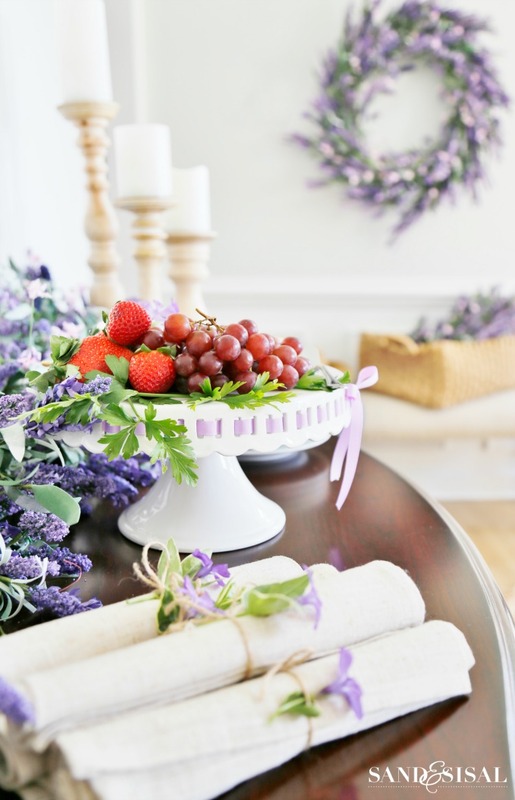 Garlands can be draped above window treatments, hung elegantly from stair banisters, spread down the center of a long table as a centerpiece, placed across a mantel, or used as a backdrop across buffets and sideboards. 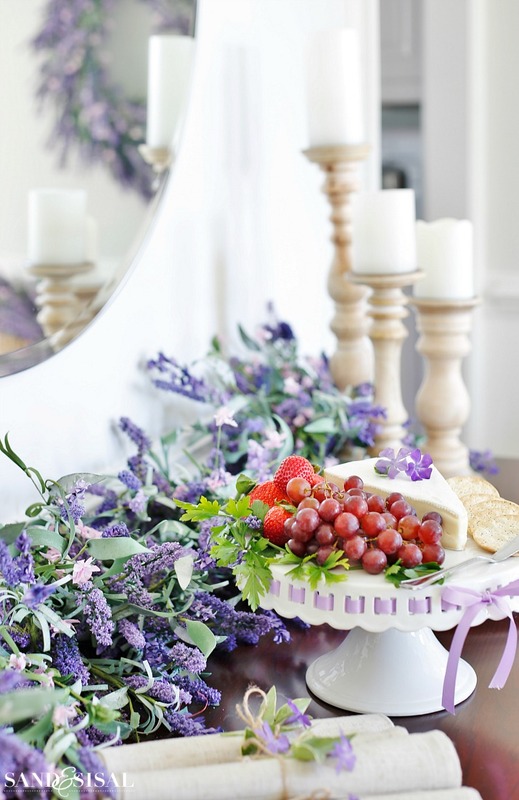 I’m using this gorgeous Provencal Lavender Garland across my buffet table. 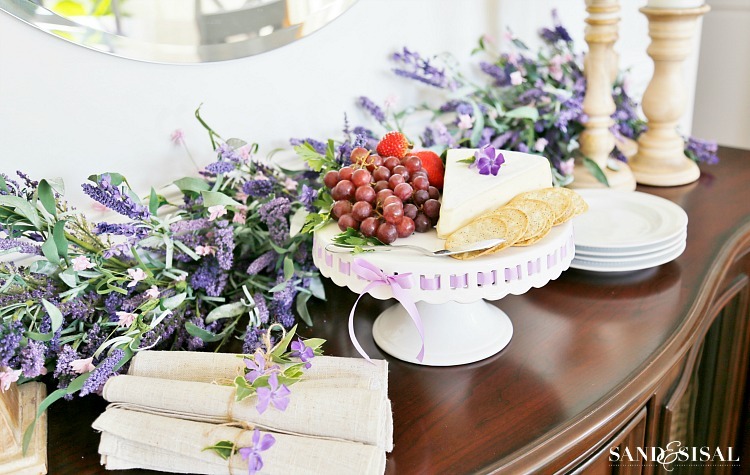 The garland is the perfect backdrop to an elegant and easy entertaining display of a creamy brie wedge, cracked pepper water wafers, juicy grapes, and sweet strawberries. Isn’t it pretty? The faux foliage has long lavender stalks in soft shades of purples and pinks with silver-gray leaves. The garland is a generous 6 feet long and very full. I have a few little tricks that I like to use when decorating with faux flowers. 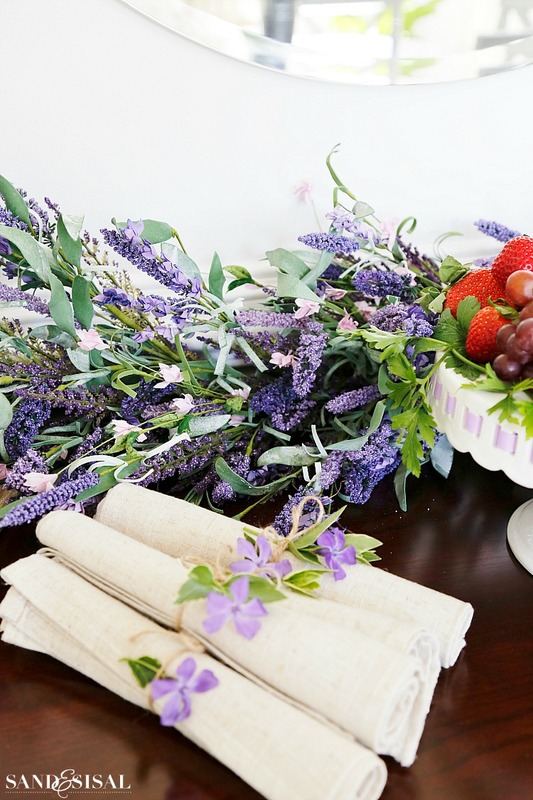 I like bringing in a mix of real flowers or greenery that are in the similar color palette. I placed real lavender colored tulips on the dining room table and tucked purple vinca vine blooms from the yard into linen cloth napkins tied with twine. Easy elegance!For an extra dose of realism, I lightly sprayed the wreath, swag, and garland with lavender linen spray. The subtle scent of lavender immediately fools the mind and eye into thinking they are real. 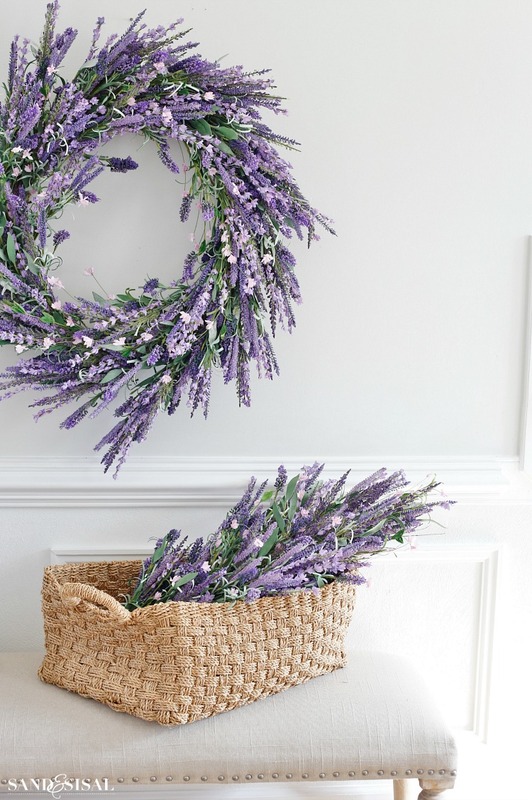 Why stop with just a garland when you can have an incredible lavender wreath and swag too? 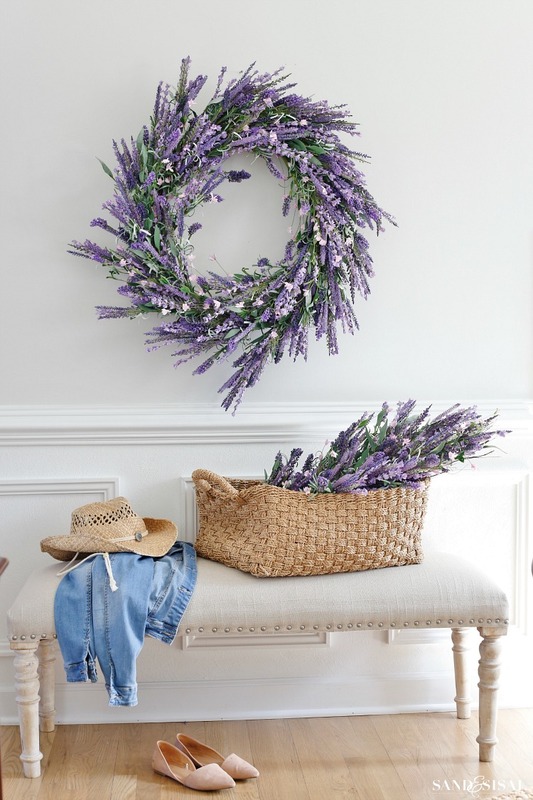 I have been wanting a Provencal Lavender Wreath for years and this one so pretty and large, I’m thrilled to be able to complete the look and use these all year round. 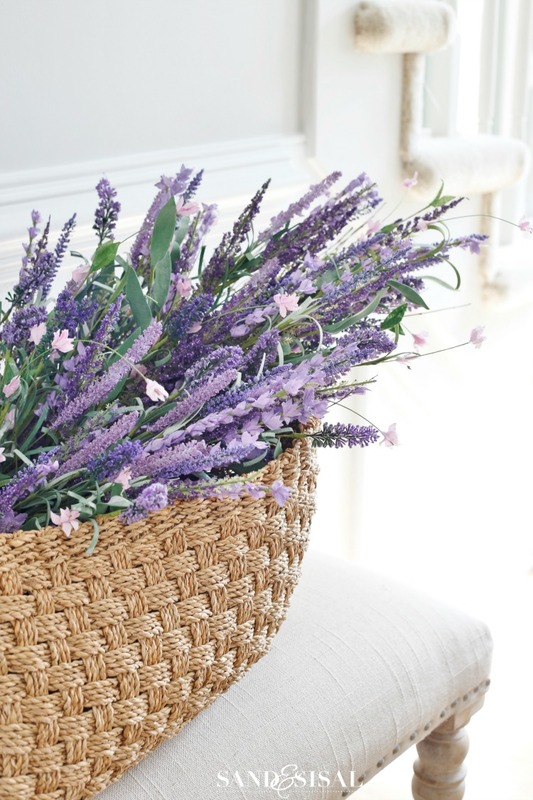 The Provencal Lavender Swag can be hung on the wall or nestled in a beautiful woven basket. 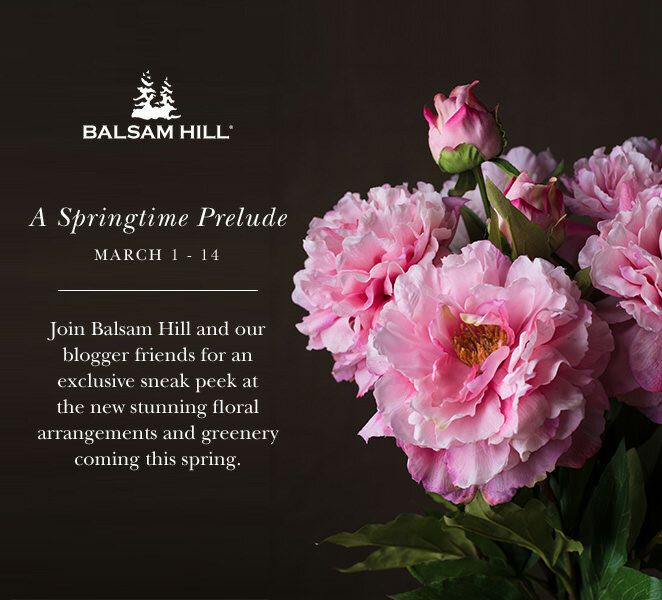 Balsam Hill is so excited to unveil their new fabulous faux florals that they are offering a discount code for any floral item of your choosing. to take 15% off any floral purchase through March 31, 2017. I’m joing with several of my blogger friends to showcase the new floral collection in our homes. Be sure to check them all out to gather ideas and spring decorating inspiration. I’m certainly enjoying Florida’s Spring weather! My favorite nursery opened for the season. Yesterday, I purchased a bountiful of annuals, perennials, and a few palm trees for my coastal backyard and pool area. I have to mention that I bought a large pot of Lavender that I put in a hyacinth basket. It looks gorgeous! I believe you and I love the same things, Kim! Enjoy your Spring weather! Gorgeous! 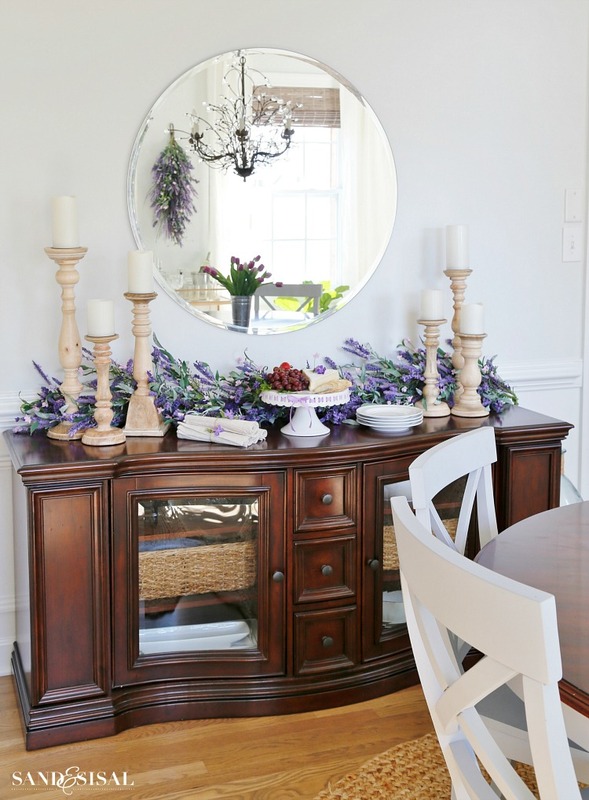 I love lavender and this looks so pretty in your dining room. Great spring inspo pics! Beautiful! 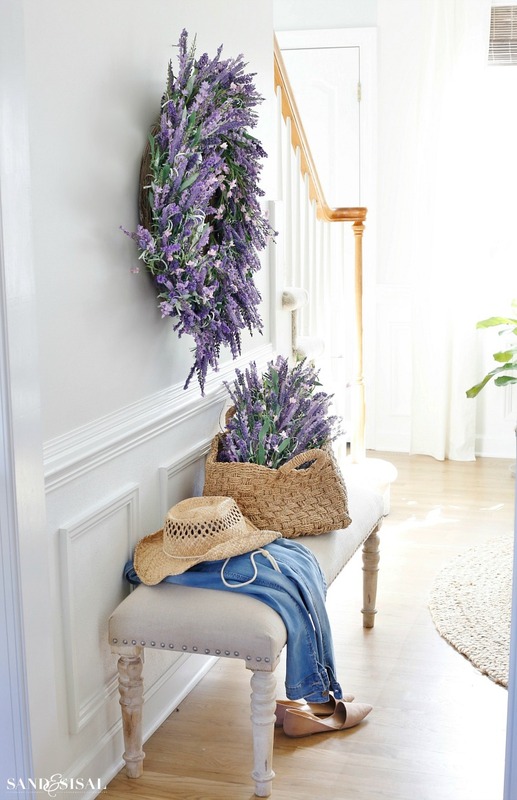 Love the wreath with the basket of lavender! Happy Spring! 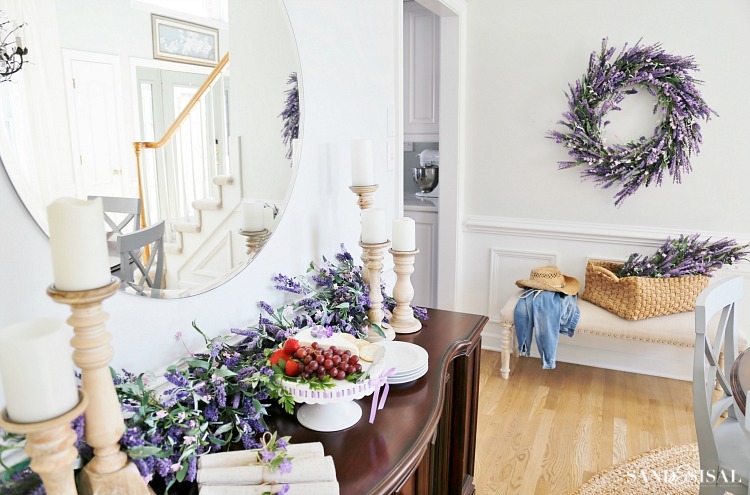 The lavender wreath is STUNNING!! I need one in my home!